Mr Lam, Managing Director of Forward Winsome Industries Limited, holds a wide range of public positions. 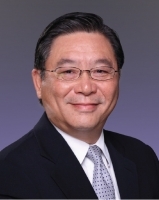 He is Member of the National Committee of the Chinese People’s Political Consultative Conference, Executive Council and Legislative Council of the HKSAR, General Committee of the Hong Kong General Chamber of Commerce, General Committee of the Federation of Hong Kong Industries and Board Member of the Airport Authority. He is also Chairman of the Independent Commission Against Corruption (ICAC) Complaints Committee and Honorary Member of the PolyU Court.